Today I got to see my friend Donna again! Here we all are at Luna Cafe! The Knitting Gang: Donna (Brown in back), Tanya, Kara (Black in front on left), Viki (Green in front on right), Em (if you can't pick me out well...) and Zoe (in the back with the Green on) Brittany is not pictured because she went to work before we remembered to get a photo. The new idea is for us to go from Coffee House to Coffee House discovering new places in good old Green Bay (and the surrounding areas) to knit. Love the idea. Need a good reason to get up on Saturday and go knitting. So I have to thank Ms. Tracey S for getting me hooked on spinning! Last year I got this beautiful spindle and soft alpaca(?) yarn. After Zoe, aka my friend who looks like me, but is so much more talented than me, showed me how to start, I've been spinning like crazy! My new love went underground during the Christmas Season and Winter Break but it now makes a return. I got some roaving (YES IT IS INTERLACEMENTS) yarn to work on. Since Tracey is a spinner, I decided to take my spinning to work on while I was in California. I did more spinning than actual knitting (probably because I didn't want to look at that beaded scarf after a day of demos...) I found myself having a hard time keeping the yarn on the hook unless I twisted the yarn around the hook a few times. I discovered that I twist my yarn quite a few times before I add it underneath. I am pretty proud how I am able to connect two strands of Rovan together. I have no idea how I do it, but everytime I do it, it looks better. My first attempt there was an obvious clump. The photo above is my latest attempt (please note photos could be taken with higher quality if I wasn't so lazy). I'm loving how it is looking more and more natural as I spin with the yarn. My goal is to make the yarn consistent, regardless of the size. Sadly, my spindle did not last for the entire trip. I make pretty bulky yarn. I don't like spinning really small yarns. Perhaps because I am impatient when it comes to drafting. Spin on a spinning machine. Not sure where to find one of those, but I'd like to give the spinning on a wheel a chance. Know how to do the next step in spinning. Zoe bought me a Knitty Knack Thingy for me at Stitches West. I haven't gotten it back yet, but when I do, I'd like to know what to do with it. Actually make something with the yarn that I made. Maybe a pair of mittens? Ha.Ha. Probably not. Maybe a headband. Something small but something I will wear a lot! Spin thinner yarn. I love the bulky, but spinning to make thinner yarn would be a new adventure I would love to test out. Will I make my goals? Let us hope so! Here are some pics of my new shrug!!!! Bulky Shurg: Made with Toasty Toes! So I finally got to go to California! Katy Perry's explanation of what California is like in the song "California Girls" is not accurate. Instead of sluty girls and melting popsicles in a world made of Candy, we got lots of rain and a nice breeze. During this time of the year it is very common for it to rain and be a little chilly. We were inside for most of the day, but since we are "stuck" here in California we will be getting some quality outside time. I am so excited! It took a lot of work to get here (with the missing school and the affects that brought on me...) but I am so glad I am here!!!! My weekend started with meeting team Ravelry! We didn't spend a lot of time at the party because I just rolled into the airport moments before. Tanya and Zoe went with Tracey and I came by myself on Thursday afternoon. After a long night of delays and fog and screwed up Flight Attendants that were rude (at least on the first flight) I was ready to go to my hotel. Little did I know, our hotel, was, the evil, sadistic, Hilton. Why didn't I like the Hilton? Well, I didn't MIND the Hilton but let me tell you about how to do quality service. First of all, if you have four people to a room and notice that they all shower, you leave enough towels and wash clothes for the people to shower. You don't leave just 2 of each when there are 4 people. Especially if you leave about 16 pillows in the room for these four people who apparently value the amount of pillows they use while sleeping over the importance and consideration of personal hygene. Secondly, when there is a line of 1,000 people at Star Bucks you have more than 1 person behind the counter. It's just common sense. Also, you don't serve people raw pancakes. It's bad for their digestive system, plus it break a lot of health codes. I know that all of these and beyond were bothering my friends; me well, I lived in a hostile for a week and peed in a bucket I had to drag up hill after paying a quarter, so honestly, I was glad I didn't have THAT problem again. HOWEVER, I'm glad we moved. Now I get Free WiFi we don't have to steal, a massage chair and 2 pillows and enough towels to bathe us. Over the course of the weekend, I went from the quiet little working bee and became the demo-beaded-scarf girl. That's right, I taught people how to string their beads onto their Tiny Toes and New York 200. Sounds like a boring job, but it was a blast!! Zoe and Tanya were talking about how I have this energy that brings people to the booth or something. Honestly, I think they all like the yarn, not the sales rep trying to get them to spend money;) There were crowds and crowds of people watching me string beads to the yarn. WHOA!!!! It was cool to see people go from not interested in our booth to buying 2, 3 scarf kits. During the day, I used my teacher insight and realized that nobody was fully understanding the process. I was doing the best I could to explain the process, but nothing beats the opportunity to see something fully done. Since I couldn't do that because of lack of space/time, Tanya and I created a YouTube Tutorial on how to bead up the project. If you would like to see it please click here. We made it at about 1:30AM in the hotel lobby so please forgive me for all of my...well...Em'ness that comes with my personality. Stitches was the first time I was able to feature my cropped sweater. It was made with the Interlacements' Toasty Toes Yarn. I kept on screwing it up at the PJ party because I was well...having a lot of fun there, and it is hard to focus when there are so many things going on. Here is a pic of me in my sweater. It's a little hard to see. I'll post better pictures when I get home! We had a PJ contest and a slipper contest. I didn't partake in any of them (my PJs were secretly the best and I didn't want to hoard ALL the yarn) but Zoe and Tanya did. Tanya got runner up on the slippers and Zoe didn't place when she should have. And then the best news...I had the privilege to meet Mrs. Cascade aka Shannon at the PJ party. I explained to Shannon about the 60 Quick Knits Blog. She fell in love with the blog and asked us to post it on the Cascade website!!! I sent a personal email to her to pass on to other cool companies such as Vogue Knitting:) Success! Yesterday our blog had over 180 hits!!! Brittany and I are estastic! As I sit in the lounge at the Avatar hotel, I am ready to get my legs a moving and go on a nice quiet walk (or loud one if a friend joins me-either way no worries) Things are going well here! I'm sad to leave on Wednesday, thank goodness we had a few extra days here to enjoy the CA Sunshine! WOW! Has it BEEN A WEEK or what? Last weekend was quite an adventure. Our annual SNC Parish Dinner Dance was last weekend. My friend Brigid and I went hoping to have a blast like last year! It was a lot of fun, although not as many people as last year. Last year was the 40th year the Parish was open, so everybody went all out. There were priests dancing to the disco and the eldery doing the Cha Cha Slide. Francis and I at the dance. Don't I look like a million bucks?? In other news, nothing too much going on, except for that trip that I am taking!!! I am so excited! My friends, Zoe, Tanya and Tracy are boarding the airplane in only a few hours! (While I am stuck here trying to find references and finish up homework.) I packed my bags last night. Last night it seemed that my friends were having issues packing all of their things, but not me. I actually had room in my stuff last night to pack more...but I won't. And I am going to take out some more clothes. I don't need ALL that stuff, after all, I am going to be gone for only a few days. I am currently working on a bulky shrug to wear at Stitches. I am almost done with it, except I need to get some 10 or 10.5DPNS to knit with for the sleeves and finish the top with some 2x2 ribbing. As you can see it is a pretty quick knit. This is the Knitting Pure and Simple Bulky Shrug Pattern. I knitted this shrug with Interlacements (no surprise there) Toasty Toes Turkish Color. I love the feeling of Toasty Toes in my hands. It is very smooth but it is a great "meat and potatoes" type of yarn. All 475 yards of the stuff. This week, the only thing I have been doing is starting new projects!! Every day for the past few days, I have been starting new projects. All the projects are from the 60 Quick Knits Book. This is because I am trying to beat Brittany on how many of them I make (actually, that is not true, we are trying to knit the entire book together.) I am probably starting a bunch of knitting projects because I am so excited about how we are knitting the entire book. Also, in a week, I will be going to California to Stitches West, where there will be tons of knitting opportunities to be seen soon! I'll be working at the Interlacements knitting booth with Zoe, Tanya and Tracy. Tracy and I meet in 2008 at Loops and Links. She was doing a sock demonstration for Shana. I loved the socks. Zoe and Tracy kept in contact over the years. In 2010, Zoe, Tanya and I went to Stitches Midwest. We meet up with Tracy and she invited us to help her with the booth at Stitches West in Santa Clara, California! We have been working hard on prepping for the show! I have done some organizing, modeling and making a sample for the show. Interlacement Yarns...LOVE ALL OF IT! Modeling for Tracy! Awesome huh? I'm making the Basketweave scarf out of Nashua Creative Focus Worsted Olive Green Yarn. I love the feeling of the yarn between my fingers. I don't like the basketweave stitch because it hurts my hands. I will be blocking this project after I'm done because it is too difficult to keep the stitches in a nice straight line. I'm making this out of Berant Alpaca Yarn. This hat is a work in progress, but it knitted up quickly! Cathie, my co-worker at SNC Parish, asked me to make her something to keep her face warm as well as her head. I love the graph and it is easy to follow! This was the project I was working on during the Superbowl (GO PACKERS!) I'm having such a hard time making the bobbles. I had my friend Zoe teach me how to make them. Thankfully, she's near by so she can help me out whenever I need it! I started these in the summer, but quite frankly, I didn't make them correctly so I had to rip them out. 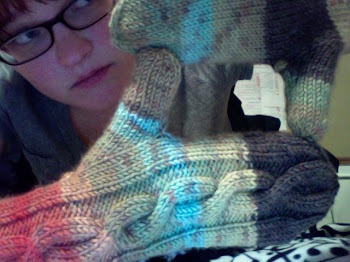 Now I am working on the other mitten. I'm using Encore Chunky. Since the are XOXO mittens, they are being made in red, in honor of Valenine's Day. Don't forget to go look at my other blog that I am making with Brittany. Our blog, Knitting 60 Projects from 60 Quick Knits is all about our adventures in making all 60 patterns from the book! Brittany and I are determined to make the dream come true, so feel free to take a look at it while we are on that journey! I am currently on a quest to A/make more knitted objects from 60 Quick Knits than Brittany and B/to knit this beaded scarf. This is a picture of the group outside of the school we taught at: Morris Jeff Community School in New Orleans, LA. After we took this picture, I learned the Super Dome is right down the street. My peers weren't surprised, they just smiled and acknowledged that it is true: I really don't always play with a full deck. Nevertheless, they accept me for the Church/Knitting/Missing Crayons in the Box type of person I am:) Plus they think I'm funny!!! 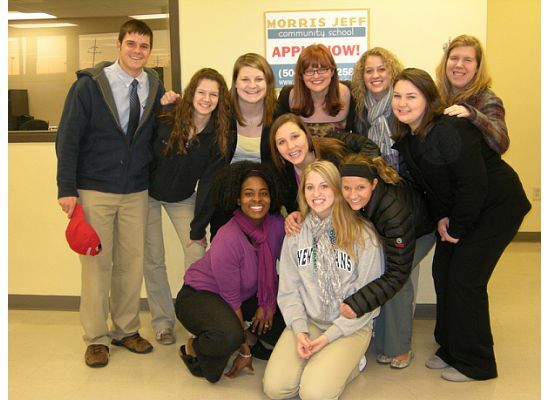 From Left to Right: Tim, Carrie, Andrea, eM, Rachel, Katie B, Brittany, Katie H, Dr. Meidl, Lauren and Noelle. We were outside of the main office at Morris Jeff School on our last day there:( We miss it! Since we were pretty much full time teachers...the whole "knitting durning down time" turned into eating Binnets at the French Quarter and sleeping in a hostile with 45 other people. Sleep was a luxury and didn't happen for more than 5 hours at a time. Which explains why I didn't knit anything during that trip. Like I said, great time, just not a lot of knitting time. Hence, I'm behind. Currently, I'm about a 1/3 way done with it. My goal is to finish before Stitches 2011!! It takes a long time to work on because there are so many beads to move. As you can see from the picture above, you have your yarn on a big cardboard spool. You unravel the yarn, push the beads back and then wind it back up and knit again. You think you pushed it far enough back...and guess what... you did NOT! Good news though, the more you knit with it, the quicker the bead moving becomes. It becomes habit and you can estimate how many rows you are going to be going through before you need to wind up again. It just takes time to figure out. You become a pro at moving beads and since you use beads in every row, you have less beads to work with as you knit more of the scarf. Knitting with beads is hard, at least at first. 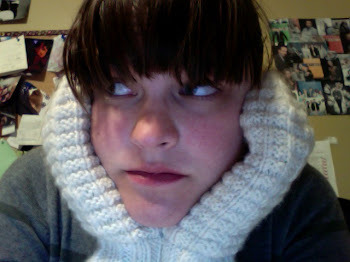 I felt very clumsy while trying to perfect the knitted ridges of the scarf. Now that I have past the decreases, it is a lot more flowing than before. We shall see when I cast on for the other side if I am as clumsy. I will at least be able to be helpful by knowing how the kit works. I am pretty sure the kit is a popular item from Interlacements. And no offense to California people, but what do you wear in terms of knitting out there? You can't wear wool scarves, so pretty beaded scarves are a pretty safe bet. Supposedly, solid colors are in fashion this year. At first I was a little discouraged about the colors. Black Tiny Toes Yarn and Black Metallic beads...it's like I'm knitting for my mom again:/ But, I was wrong and love the make up of the scarf. I think it looks classy and artistic at the same time. It's like my mom and my fashion sense combined into one! This scarf is really pretty and feels great to knit up. You can check out kits to make this scarf at the Interlacements Yarn Website. I am a fitness and food nut. I lost 40 pounds back in 2012 when my mother needed emergency surgery to get a stent put in for her heart. I knew it was time to make a change in my life. Forty pounds later I have never been happier or healthier! I am an avid runner (currently injured right now), proud 80/20 clean eater with a Paleo influence and a proud tea sipper! This blog is about my adventures in food, fitness and making all the right choices on the journey. Waffle Mittens, The Original Pair!